What is known of three of Barnet and Fanny's six children was outlined in the previous chapter. The next member of the family to be of most interest to us is John, but some detail is known of his brother William's career as a merchant seaman, and some of the events in their sisters Barnetta's and Susan's lives. To deal with Barnetta first, she was baptised on 21st October 1838. She appears in the 1841 Census at the age of 3, living on the Quay with her widowed mother, brothers John and William, and half-brother George. In 1851, she was still living on the Quay, but now with her grandparents John and Elizabeth Elliott. George was also in the house. Although only 12, Barnetta is recorded as being occupied as a house servant. In 1861 and 1871 she has not been found on the Census, but in 1881, she was living at Buscott. Barnetta was now Mrs. McBain, having married at some time a retired soldier, Robert McBain, seven years her senior. By coincidence, Robert's birthplace is given as Kircudbright, Scotland, the place where the Princes' first ship, the JOHNS, was originally registered. Also in the house is Rabina McBain, a 21 year old dressmaker. She is shown as daughter of Robert, but there is no way of knowing whether Barnetta is her mother. Rabina's birthplace is given as Broughton, in London, and it seems likely that, and it seems likely that Barnetta found her way to London at some time in the previous 25 years, where she married Robert. The fourth member of the household is also interesting. Named as Wilhelmina Prince, she was 3 weeks old at the time of the Census. She is shown as being Robert's grand-daughter, presumably Rabina's child, although Rabina was unmarried. Robert died in Bideford in 1885; his wife survived him by 15 years, dying in 1900, also in Bideford. Rabina married Thomas McAuliffe in Cardiff early in 1895; they settled in Cardiff and had at least two children, Barnetta in 1896 and James in 1898. In the 1901 Census Wilhelmina, unmarried but now with the surname McBain, was visiting the family in Cardiff. Susan married Thomas Tremeer, a Bradworthy man, in 1850, and their son Barnet Prince Tremeer, was born later in the same year. In the 1851 Census the family were living on Lundy Island; Thomas is a husbandman and Susan a dairy maid. The family then seem to disappear from public records, as no further trace of either Susan or Thomas have been found. However, their son Barnet re-appears in 1875, when he marries Eliza Jane Bond, a native of Hartland. It is possible that at some time between 1851 and 1861 Susan and Thomas emigrated, taking Barnet with them, and the latter returned to England as a grown man. However, this research so far has failed to prove this theory. In 1881 Barnet and Eliza Tremeer appears in the Census living in Canton, Cardiff. Barnet's occupation is given as 'Mariner'. In 1891 and 1901 the family still in Cardiff. Barnet's occupation is given as 'Haulier'. In total the couple had eleven children: Eliza (1876), Barnetta (1877), Susan (1880), Frances (1883), Lydia (1885), Lucy (1887), Mabel (1889), Emily (1890), Georgina (1892), Miriam (1897) and William (1898). All were born in Cardiff, with the exception of Barnetta, who was born in Hartland. Barnet Prince Tremeer died in Cardiff in 1926 and his wife Eliza Jane in 1932, also in Cardiff. William was born on 5th August 1830, and baptised three weeks later, on the 28th. He first saw service at sea at the age of 10, serving as a 'boy', and was officially ticketed as a merchant seaman four years later. The Register of Seaman's Tickets 1845-54 describes him as being 4ft 91/2in tall, of fair complexion, and with brown hair and hazel eyes. He had not served in the Navy, or foreign service. Unusually for the time, William could read and write. The only recorded voyage is one in 1846, sailing from Bideford. Unfortunately, the name of the ship and the nature of the voyage have not so far been traced. The same Register shows that John was born on 1st May 1832 (he was baptised on 26th). Like his brother, John first went to sea as a 'boy', but when this was is not shown. Despite the fact that the ticket was issued in 1852 when John was 20, his height is given as 'growing'. No other description is included. At the time he had not served in the Navy or foreign trade. There are two recorded voyages, both from Bideford in 1851, when he served as a Mate. As with William's record, the ships have not been traced. Although vessels and their crew were recorded at the time of the 1851 Census, the records have not been kept, and although both John and William were away from Clovelly on Census night, there is no way of telling which ships they were on. William married Ann Brend at Bideford Registry Office on 20th September 1853. Ann, the same age as William, was the daughter of Francis and Mary Brend, and had been born in Woolsfardisworthy. In 1851 she had been working as a servant, living with the family of Charles Prouse. The 1861 Census finds William and Ann living at 120 High Street, Bideford; in 1871, however, William was away at sea, as Ann is shown as 'Head of Household in absence of husband'. In the 1881 Census Ann was in Roath, Cardiff, shown as a Lodger at 28 Prince Leopold Street, the home of William R Williams, a 'Time Keeper'; Ann is still married, her occupation is given as 'Ship's Steward's wife'. Two other occupants of the house are Betsy Lock, Mr William's grandmother, and Mary Shapcott, his aunt; both were born in Bideford. In the 1891 Census William is at home. He and Ann now in living in 1 Prince Leopold Street, Roath. Also with them is a Rabina Bain, their niece, a domestic housemaid. Is this Rabina McBain, daughter of William's sister Barnetta. There are some discrepancies in that the surname is not McBain, and her age is given as 23, whereas Barnetta's daughter would have been 31; however, the birthplace, Middlesex, is correct, and as we have seen, Rabina married in Cardiff two years later. No record of William and Ann has been found in the 1901 Census for either England or Wales. A further Register records seamen's services between 1853 and 1857, and although less detailed than the previous one, it does name the ships on which a man served. These entries show that William sailed in 1854 on a ship the ENTERPRISE and in 1855 on the OCEAN QUEEN, a Bristol registered vessel. The latter ship had the task of carrying a group of emigrants to Canada. The ship left Bristol on 19th March 1855, and passengers embarked at Appledore 12 days later. The ship, commanded by Richard Dart, left Appledore on 2nd April and arrived at Quebec on 20th June. The return journey was somewhat quicker, as the OCEAN QUEEN was back in Bristol on 26th July. One of the passengers on the outward voyage, William Gliddon, kept a log of the journey, and this appears in the book "Towards Quebec" by Ann Giffard. This contains a list of the 20 crew, including Seaman William Prince, aged 24. Most of the crew were Appledore men, although there is one other native of Clovelly, 39 year old William Jewell, although he was taken ill and left the ship before it sailed from North Devon. he fell from the top Gallant Yard and struck the Top Gallant rail by the main rigging and fell overboard. Witnesses Richard prince Vine Master Cert No15473 Born 1834 in Clovelly England. John Mickelwright Mate Cert No24046 Born 1833 Clovelly England. A Crew List from Bridgewater exists which shows William, aged 40, as bosun on the WINIFRED in 1872 and 1873; the ship had a crew of 18 and included three other Clovelly men. The ship was sailing from Swansea to Barbados. The Clovelly Parish Register shows that John was born on 1st May 1832 (he was baptised on 26th). Like his brother, John first went to sea as a 'boy', but when this was is not shown. Despite the fact that the ticket was issued in 1852 when John was 20, his height is given as 'growing'. No other description is included. At the time he had not served in the Navy or foreign trade. There are two recorded voyages, both from Bideford in 1851, when he served as a Mate. As with William's record, the ships have not been traced. Although vessels and their crew were recorded at the time of the 1851 Census, the records have not been kept, and although both John and William were away from Clovelly on Census night, there is no way of telling which ships they were on. The Register of seamen's services 1853 - 1857 shows that John served on two ships in 1854, one the BELLONA and the other the ELLEN SOPHIA. The latter vessel was a barque of 247 tons, and had been built at Bideford in 1854. Its owners are recorded in Lloyds Shipping Register as being 'Fernandez of Bideford', and it traded between England and South America. The BELLONA was first registered at Bideford in 1648. She was an 80ft long, two masted brig of 161 tons. The registered owners were Joshua Williams of Appledore and George Williams of Bideford. At the time of John's service on her, George Williams was also Master. Unfortunately very few Crew Lists and Agreements for vessels registered in Bideford have survived, but those that do still exist tell a great deal about the life of a merchant seaman in the 1850s. The Agreement for one voyage of the BELLONA shows such detail. The total crew was nine, and John served as boatswain, having served on the same vessel during its previous trip. The voyage was from 'Newport to Malta or any other Port or Ports in the Mediterranean or elsewhere wherein freight or cargo may offer and back to a final Port of Discharge in the United Kingdom. Time of Service not to exceed twelve months'. In fact, the voyage lasted from 24th April to 21st July. For this, John received £3 15s when he signed on, and £3 15s a month during the voyage. The crew were each allowed 1lb of bread a day, and 1lb of meat (beef and pork on alternate days). Other rations included flour, tea, coffee, sugar, butter and, of course, water. However, a note has been added to the effect that no spirits were allowed. At the end of the voyage the crew were discharged at Newport, and John's conduct is given as 'Good'. Later, the records were subsequently kept in such a way that it is almost impossible to trace a man's service in the merchant navy after 1857, but the indications are that John had settled in Clovelly by then. On 23rd August 1857 he married Maria Bartholomew Burman. Maria had been born in 1825, the daughter of Thomas Burman and Maria Bartholomew. The Burmans were a long-established family in the area, and had been involved in several occupations. William himself was a fishmonger, but other recorded occupations of members of the family are blacksmith, tailor and shoemaker. Maria's great-grandfather Richard Burman had married a Hamlyn in 1766. The 1861 Census finds the couple living with Maria's father, by then a widower, in a house on the Quay. Thomas's wife had died eight years earlier at the age of 53; Thomas himself was a widower for 23 years, as he lived until 1876. John's occupation is still shown as 'seaman, merchant service'. Also in the house was John and Maria's first child, their eight month old daughter Charlotte. 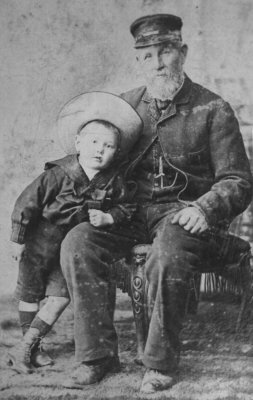 One year later their other child, William Burman was born, in 1862. 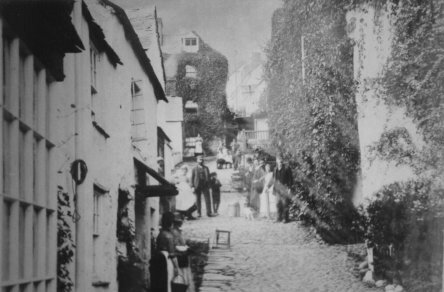 John and Maria continued to live in Clovelly, and by the time of the 1871 Census they had moved from the Quay. Unfortunately the Census is not very helpful, giving the address merely as 'Village'. Maria's father was still living with them, as were their children, both of whom were shown as being 'Scholars'. John at this time gave the occupation of 'Carrier'. The 1881 Census finds them at an address given as No.46, Village. John's occupation has now changed to 'Fisherman'. The 20 year old Charlotte was still living with her parents, earning a living as a domestic servant, but William, who would have been 19 that year, does not appear on the Census anywhere in Clovelly, and it must be assumed that he was away at sea at the time. Maria died seven years later, on 21st July 1888, at the age of 62, but not before seeing her son married. John died on 19th June 1899, having seen four of his son's five children come into the world, and in common with many Princes, is buried in Clovelly churchyard, a headstone commemorating both him and his wife.